[INQ. NO. 1510M09] Sungsung Industrial Machinery is a company that manufactures Lifting magnets, Magnetic separators and Cable reel. Knowing the importance of the technological expertise in manufacturing of industrial machineries, the company has made a continuous investment on R&D since its establishment in 1986. There are currently two major product groups for the company – Lifting magnets (Circular magnet, Rectangular magnets, and Bi-polar magnets, etc. ), Magnetic separators(Suspended magnetic separators, Shredder magnetic drum separator, Drum separator, Magnetic pulley). 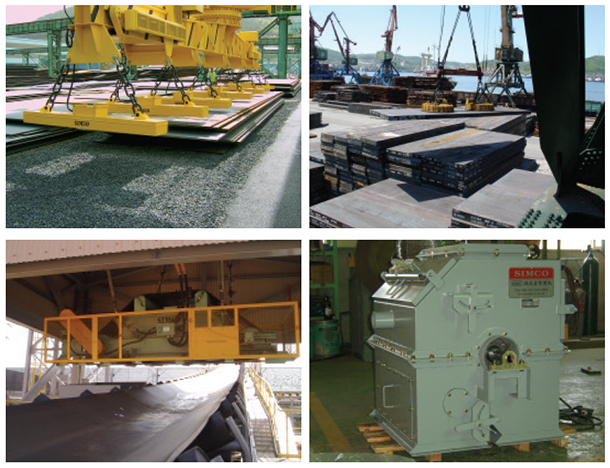 Various types of lifting magnets can be now used at any working fields such as iron and steel making factories, shipbuilding yard, steel scrap yard, etc. No matter what your load or specialty handling “mix” may be, SIMCO’s Electro Lifting Magnets can handle them with new speed and money-saving efficiency. SIMCO’s magnetic separators are used to separate ferrous material from non-ferrous material in four types of operation, which include protection of processing equipment such as crushers, pulverizers, conveyor belt, screen, etc., from damage by removing tramp iron at mining plant, thermal power plant and etc., purification of product or ingredient for higher quality end product by removing iron from material in process such as foundary sand, glass cullet, grain, food products, chemical, etc., reclamation of either the ferrous or non-ferrous material from open hearth and blast furnace slag, incinerator and garbage plant products, etc., and salvage of valuable tools, cutter bits and machinery parts.